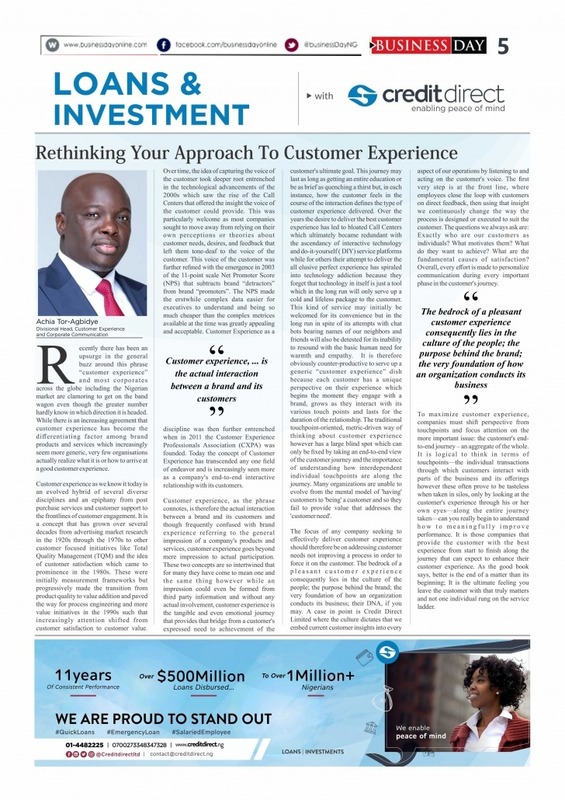 Recently there has been an upsurge in the general buzz around this phrase “customer experience” and most corporates across the globe including the Nigerian market are clamoring to get on the band wagon even though the greater number hardly know in which direction it is headed. While there is an increasing agreement that customer experience has become the differentiating factor among brand products and services which increasingly seem more generic, very few organisations actually realize what it is or how to arrive at a good customer experience. Customer experience as we know it today is an evolved hybrid of several diverse disciplines and an epiphany from post purchase services and customer support to the frontlines of customer engagement. It is a concept that has grown over several decades from advertising market research in the 1920s through the 1970s to other customer focused initiatives like Total Quality Management (TQM) and the idea of customer satisfaction which came to prominence in the 1980s. These were initially measurement frameworks but progressively made the transition from product quality to value addition and paved the way for process engineering and more value initiatives in the 1990s such that increasingly attention shifted from customer satisfaction to customer value. Over time, the idea of capturing the voice of the customer took deeper root entrenched in the technological advancements of the 2000s which saw the rise of the Call Centers that offered the insight the voice of the customer could provide. This was particularly welcome as most companies sought to move away from relying on their own perceptions or theories about customer needs, desires, and feedback that left them tone-deaf to the voice of the customer. This voice of the customer was further refined with the emergence in 2003 of the 11-point scale Net Promoter Score (NPS) that subtracts brand “detractors” from brand “promoters”. The NPS made the erstwhile complex data easier for executives to understand and being so much cheaper than the complex metrices available at the time was greatly appealing and acceptable. Customer Experience as a discipline was then further entrenched when in 2011 the Customer Experience Professionals Association (CXPA) was founded. Today the concept of Customer Experience has transcended any one field of endeavor and is increasingly seen more as a company’s end-to-end interactive relationship with its customers. Call Centers which ultimately became redundant with the ascendancy of interactive technology and do-it-yourself ( DIY) service platforms while for others their attempt to deliver the all elusive perfect experience has spiraled into technology addiction because they forget that technology in itself is just a tool which in the long run will only serve up a cold and lifeless package to the customer. This kind of service may initially be welcomed for its convenience but in the long run in spite of its attempts with chat bots bearing names of our neighbors and friends will also be detested for its inability to resound with the basic human need for warmth and empathy. It is therefore obviously counter-productive to serve up a generic “customer experience” dish because each customer has a unique perspective on their experience which begins the moment they engage with a brand, grows as they interact with its various touch points and lasts for the duration of the relationship. The traditional touchpoint-oriented, metric-driven way of thinking about customer experience however has a large blind spot which can only be fixed by taking an end-to-end view of the customer journey and the importance of understanding how interdependent individual touchpoints are along the journey. Many organizations are unable to evolve from the mental model of ‘having’ customers to ‘being’ a customer and so they fail to provide value that addresses the ‘customer need’. The focus of any company seeking to effectively deliver customer experience should therefore be on addressing customer needs not improving a process in order to force it on the customer. The bedrock of a pleasant customer experience consequently lies in the culture of the people; the purpose behind the brand; the very foundation of how an organization conducts its business; their DNA, if you may. A case in point is Credit Direct Limited where the culture dictates that we embed current customer insights into every aspect of our operations by listening to and acting on the customer’s voice. The first very step is at the front line, where employees close the loop with customers on direct feedback, then using that insight we continuously change the way the process is designed or executed to suit the customer. The questions we always ask are: Exactly who are our customers as individuals? What motivates them? What do they want to achieve? What are the fundamental causes of satisfaction? Overall, every effort is made to personalize communication during every important phase in the customer’s journey. To maximize customer experience, companies must shift perspective from touchpoints and focus attention on the more important issue: the customer’s end-to-end journey – an aggregate of the whole. It is logical to think in terms of touchpoints—the individual transactions through which customers interact with parts of the business and its offerings however these often prove to be tasteless when taken in silos, only by looking at the customer’s experience through his or her own eyes—along the entire journey taken—can you really begin to understand how to meaningfully improve performance. It is those companies that provide the customer with the best experience from start to finish along the journey that can expect to enhance their customer experience. As the good book says, better is the end of a matter than its beginning; It is the ultimate feeling you leave the customer with that truly matters and not one individual rung on the service ladder. Do you need Quick Loans? Let us help you now, Get up to N5Million emergency loans within hours. Call 01 4482225.
https://www.creditdirect.ng/wp-content/uploads/2016/08/cdl-logo-white.png 0 0 Credit Direct https://www.creditdirect.ng/wp-content/uploads/2016/08/cdl-logo-white.png Credit Direct2019-04-10 16:31:382019-04-10 16:31:41Rethinking Your Approach To Customer Experience.